As I reflect on this year, I am so overwhelming proud of it all. This was my 5th season running my own CSA and my 2nd on our own land. I cannot believe how the time flies but I do know I am so grateful for all my amazing CSA members who support this tiny farm! Why am I so proud? I survived an entire growing season while pregnant. We had a healthy baby, Tillee Mae, born at home on Oct. 24th! I, along with my crew, grew over 22,000# of produce on our 1.2 acres in production for 110 CSA member families and loyal restaurants! That’s 7,000# more than 2017 on the same acreage! The CSA was full by April 1st- our earliest sell out yet! This is the first year I’ve had way more crop successes (heyyo carrots and peas!) than crop issues or failures (poor potatoes). Our dog to human ratio was nearly 2:1 most days. The first year of high tunnel growing was hugely successful (from April spring greens to big summer heirloom tomatoes to fall spinach). I trialled new fun crops like ginger, wine cap mushrooms and honey berries. The farm had it’s best year yet financially too! High tunnel crops: I am in love with my 2000 sq ft high tunnel- it has been a total game changer for some of my toughest crops. Growing under plastic cover increases soil temperature earlier and longer, reduces disease pressure/spread and overall allows for a more controlled growing environment. This means tough crops to grow in the open field, like tomatoes, cucumbers and celery, do MUCH better. It also means I can have other crops earlier, longer and of higher quality, like April lettuce, June carrots and December arugula. I got over 1000# of tomatoes from just 200’ and over 500# of cucumbers from just 75’. The celery was the highest quality crop I have ever grown. I grew some rockin’ melon varieties that would never make it in the field and even grew a few pounds of Hawaiian ginger. The high tunnel requires a lot more irrigation, soil and disease management than the field does since I grow nearly year round in there but it’s SO worth it. Carrots: after four years of struggle with this root crop, I think I finally have it figured out. #1 flame weed to kill weeds and do not disturb the soil while seeding. #2 irrigate and keep soil moist for at least 1 week. #3 wheel hoe 3-4 times and hand weed once. This all creates a great carrot crop! Peas: this was a crop I have pretty much failed on for 4 years in a row and I think I finally figured this one out too. Transplanting is key. It allows for one plant every 4” which is a struggle when direct seeding when the soil is still wet and cool due to uneven germination. It allows for the plants to get ahead of the weeds enough to get a decent harvest. I still have some fine tuning to do and my goal for next year is to get the plants weeded at least once to stay even more ahead of the voracious spring weeds. Sweet potatoes: a dream crop this year! Nearly 1300# from 4 beds that is a record harvest. I experimented with different spacing: two beds at 12” and two beds at 6". I have always done 6” spacing and thought that closer plant spacing would result in a slightly higher overall yield even if the tubers were smaller. Turns out I was WAY wrong. The 12” spaced beds not only produced nice, large tubers but also yielded nearly double the poundage. I am a convert. It’s great to do mini farm research trials like this to prove myself wrong! Watermelons: a pleasant surprise! Nearly 250 melons from 300’; totaling nearly 1300# and nearly all ready within a 3 week span. And I hear you Nibbler share folks, I am planning on trialling smaller watermelon next year so you can have melons too! Winter squash: that’s two years in a row. Perhaps my soil is great for squash!? Sweet corn: I seeded just one succession and we kept this well weeded. Produced over 1200 ears of corn from 1200’ planted! Potatoes: I had my first ever major crop failure this year. Due to all the rain we had gotten, we couldn't get them out of the field before the majority of them rotted, plain and simple. Instead of getting the normal expected yield of 1800-2400# potatoes, we got just about 200#. Since I started the farm in 2013, I've never really had any super difficult seasons or complete crop failures. Sure I've had pest and disease issues, a bad carrot year or a rough brassica fall season. But never something so complete and important as potatoes. So I pulled the "this-is-what-CSA-is-about card" I wrote about in the CSA member handbook. Meaning this is truly what CSA is at it's core: supporting your farm whether it's a good potato year or an awful one. I am super happy to say that 100% of the feedback I got about the potato crop failure was entirely supportive. Everyone said to keep my head up and try again next year. That my CSA members support me even though everyone only got potatoes once in 2018 (thankful for the good sweet potato year!). I could not have been more grateful to receive such support and I am prepping for next season assuming it will be as wet and rainy as this year. Every year, I strive to get better. These are good lessons. Greens (field fall spinach and lettuce): between the 20” of rain we got during prime seeding time and being rather pregnant, I dropped the ball on my fall field greens. Three times, each seeding that I managed to get in got either washed out or too saturated to thrive (and I farm on flat, sandy soil!). Normally I take great pride in my fall greens. But there’s always next year! In fact, that is one of my goals for next year CSA boxes: greens every week. Cantaloupe: never expected this complete crop failure even though the watermelons right next to them did splendidly! Will try again next year of course as I’ve never had a problem with this crop before this year. Our new daughter, Tillee Mae! 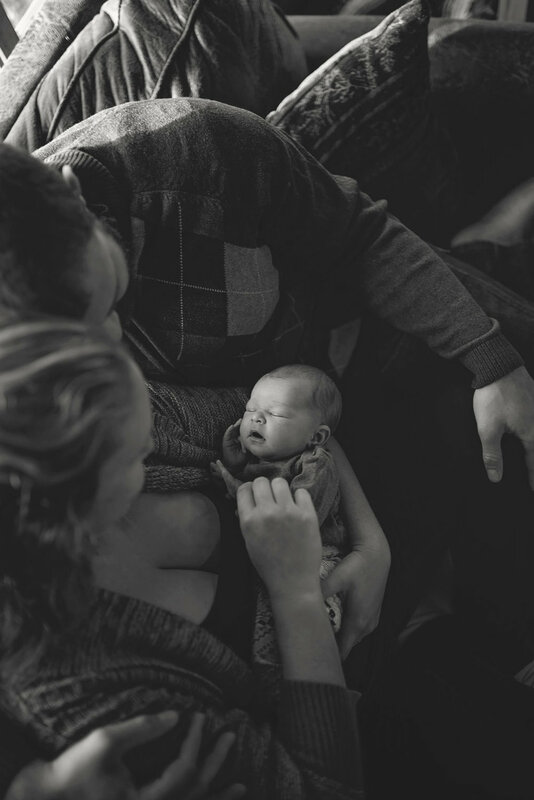 Introducing Tillee Mae Wright (plus her birth story)! On October 24th, 2018 at 7:57pm we welcomed our daughter, Tillee Mae Wright, into our lives! Born safely at home here at the farm, she weighed 7lbs 6oz and was 21 inches long. All three of us spent 6 beautiful weeks at home in our postpartum cocoon. Travis went back to work last week and I am excited to be full time with Tillee until the growing season starts. I’m sitting here now with her sleeping on my lap as I begin my winter planning for the 2019 season. The first 3 weeks were pretty challenging as new parents but I think we got the hang of it for now. Turns out having a baby is a lot like having a farm: rollercoasters of unpredictability but also a whole lot of love! We decided on having a home birth and interviewed our midwife, Veve Cobbs, before I was even pregnant. We fell in love with Veve and she spent over an hour every monthly prenatal appointment with us in our home. Even the one ultrasound we had was done in our home. After a while Veve caught on to me being a bit of a workaholic and was regularly telling me to slow down, ask my employees for help and to quit carrying heavy harvest crates. She also had me on an arsenal of prenatal vitamins, snacking every 1-2 hours and eating at least 120g of protein daily. We really enjoyed our time with Veve and if we have another child, we will definitely be having her again as our midwife! The whole home birth process was amazing. Farming while pregnant WAS NOT easy. Learning to do less and ask for help was a challenge for me. I am used to doing everything myself and I am grateful for my employees as I relied on them and asked a lot more of them than I ever had before. My work capacity had dropped significantly by September with my big belly but I felt a sense of gentleness I have never experienced before. Not everything I wanted to get done was going to get done this year and that’s okay. It was magical and liminal, those last few weeks. I was grateful to get the last regular season CSA shares out and delivered. Tillee’s estimated due date was Oct. 21st but I was secretly hoping we would get the first storage shares out and the garlic planted before she was born! The morning of the first storage share delivery (Oct. 23rd), I thought was I was in early labor. I couldn’t really help Dave pack the truck for delivery as the contractions were starting to get regular. We had a regular prenatal appointment that afternoon so I figured I would just try to keep occupied until Travis came home from work and Veve arrived. Each contraction was getting stronger and stronger but I also felt like each one was still too gentle to be active labor. I felt like I hadn’t been working that hard but I was so grateful to know I had made some progress. I likely still had a while to go and that I should do my best to get some rest overnight and try to get things to settle down. I loved knowing that, yes, I was making progress, but that no, there was no rush. This baby would come in time. By the next morning (Oct. 24th), almost everyone arrived as I was firmly in early labor: my Mom, my doula and CSA member Heidi Wiley (and her baby girl Willow whose birth I attended 3 months earlier) and Veve. I worked that morning through many contractions with help from Travis, my mom, Heidi and baby Willow. We all went on a walk to the orchard, since I wanted to get out of the house. Being on our land whom I live and make my living on gives me strength and I felt so held and supported by our land as I labored and walked and we all talked. On our way back, I had three big contractions right on top of each other and I was starting to feel like labor was getting serious. I was in active labor. The next couple hours were a blur; I fully embraced “laborland”. I labored on the floor with the birth ball supporting me. When the tub was finally full I got in and it felt amazing! Even though the contractions got more intense, I labored through each contraction in a deep squat in the tub with Travis supporting me. Our assistant midwife, Cynthia, showed up during that time too. I continued to labor into the evening and eventually made my way to the birth stool in our living room once I felt like it was time to push. It’s a strong position for me, being really comfortable in a deep squat. Travis wanted to catch our baby so he was ready in front with Veve and Cynthia. My mom and Heidi were working to support me from behind and in front. At 7:57pm her head crowned and she came quickly after into Travis’s hands. Tillee Mae was born just after the rising of the full harvest moon on October 24th- just like I was hoping! She was healthy, strong and perfect! She didn’t want to open her eyes a whole lot at first and so we waited until the morning to name her. I was the first girl born on my dad’s side (Nitz) in about 90 years, my great-great Aunt Myrtle was last other female Nitz. I met her once in Florida right before she died when I was about seven years old and she was over 90. The last three generations have been all boys and the last woman who married into the Nitz family that gave birth to my great- great Aunt Myrtle was named Tilly Rose Paumier. Tillee’s namesake. Going back even further, we don’t even know who was the last female, blood Nitz to give birth to a girl. It is truly a blessing and a great surprise to have a baby girl! As I know my parents were just as surprised when I was born. Tillee is almost seven weeks old now as I write this and she is snuggled up on my chest in her baby sling. She is nursing so wonderfully and already over 10 pounds. Veve came the first three days after her birth, again at 2 weeks and for the last time at 6 weeks. Our chiropractor even made a house call for me and the baby a week after Tillee was born. I am so grateful that the timing worked out perfectly that I can be 100% at home without much farm work for the first 6 months of Tillee’s life. Travis has been an amazing father so far and was fantastic labor support for me. I watched him fall in love with her the first time he held her. My mom is able to be out here at least one day a week and her help has been tremendously helpful as we navigate being new parents. As I look back, with the blurry and tired eyes of a new parent, on the last seven weeks since Tillee was born, I am filled with immense gratitude. I could not have asked for a more meaningful and intentional process of my pregnancy. I could not have asked for a more fulfilling birth- it was exactly what I was hoping for and prayed for. I could not have asked for a more supportive husband, family and friends. I also have deep gratitude for the billions of mothers who have come before me. Gratitude, gratitude and more gratitude.